Senix: CHEM series sensor and SenixVIEW software put the power of ultrasonics in your hands. You can quickly adjust, optimize, save and clone your applications quickly without calibration! 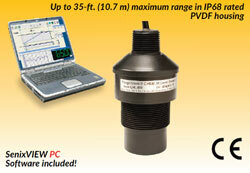 These sensors are housed in a rugged, chemically inert PVDF sealed housing for long life. They mount above the material surface and measure distance downward without contact. Outputs respond to that measured distance. Applications include pump control, bulk inventory, batch processing, water management and high/low level alarms. Use adjustable interface features like switch hysteresis and time delays to build complete solutions such as pump controls to maintain level. Save cost by eliminating PLCs, delay circuits and time delay relays! Use SenixVIEW software (see separate data sheet) to adjust all sensor features. You can view, analyze or log data to optimize your application. Disconnect and the sensor retains the setup. Application setups can be saved for future recall. From a single sensor inventory part you can quickly clone sensors, without recalibration, for any number of different field installations. In addition to the model's serial data interface there are five simultaneous outputs, fully configurable with SenixVIEW. These include voltage (0-10 VDC) and two current loops (4-20 mA sinking and sourcing). Both out- put types have user-selectable voltage/current ranges and end- points for best resolution. Easily invert the analog output slope. Two switches are SenixVIEW configurable as "PNP" or "NPN" type (sourcing or sinking). Each has adjustable set point, hysteresis, window, initial conditions, ON delay, OFF delay and loss of target response to easily create controls and alarms!